Formed in 2006, Tap Attack has since established itself as a prestigious workshop provider. The teaching faculty of 15 have taught tap classes to over 3000 tap dancers in the UK, each teacher with notable achievements in their individual dance fields aside from their tap careers. Many have worked in the West End and on tap-specific shows, such as Tap Dogs, Hot Shoe Shuffle, Singin’ in the Rain and 42nd Street. Tap Attack has achieved remarkable success since its inception. The performance company of Tap Attack – Xtreme Tap – offers a wide variety of exciting performance opportunities. Tap Attack claims its dancers are unrivalled in their ability to entertain; be it a classic tap performance or a more bespoke requirement, Xtreme Tap hosts a team of talented tappers, donning tap shoes and ankle warmers! Apart from traditional tap work, Xtreme Tap have performed at a whole host of corporate and commercial events with additional success performing at fashion shows, product launches and corporate entertaining events. With such a variety to choose from, suddenly the decision of Bloch tap shoes, Capezio tap shoes or So Danca tap shoes seems easy! The first of Tap Attack’s 2012 “Total Tap Workshops” is in Birmingham on Sunday 29th April at The Dance Workshop, supported by Capezio. The sheer variety of opportunities offered by Tap Attack is emphasised by its Total Tap Workshops, available for 3 standards of tappers. The event is marketed as a fun and informative day for attendees, adding considerable amounts to their tap repertoire. Additionally, the “Rhythm Routes” of 2012 is due to follow up its sell-out success of 2011, as an exciting collaboration between Tap Attack and the ISTD. Rhythm Routes gives participants a chance to experience the best of UK tap as a journey through tap history, designed to inspire teachers and students alike with a range of classes. Rhythm Routes 2012 is taking place on Sunday 20th May, at Preston College; tap shoes at the ready! With the growing trends of dance-related talent shows throughout the media, the trend for wearing socks as a “performance accessory” is also emerging as one that is taking the dance sector by storm. Turn to So You Think You Can Dance, Got To Dance, or Britain’s Got Talent; socks are becoming increasingly popular to aid acts in spins, falls and complex lifts. Whilst the dancers’ seemingly enhanced talent may be exciting to view and even awe-inspiring, the fact remains that there is a certain level of danger involved in wearing socks to dance, for example, an injury occurring as a result of a slip or fall. 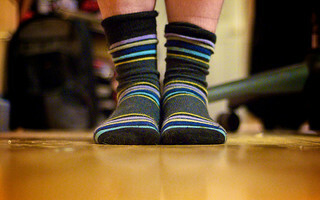 The number of YouTube clips presenting many dancers’ falls as “entertainment” are by no means criticising the wearing of socks for dance practice. 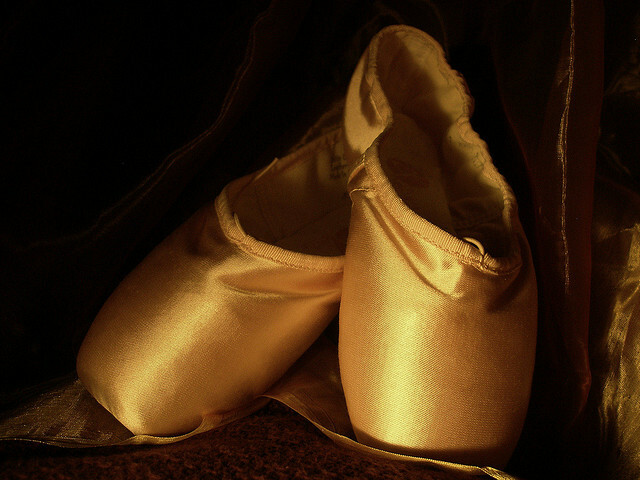 Undoubtedly, the use of socks can aid a dancer in class or rehearsals where a floor may not be suitable to dance on; however, the fact remains that during performance, the dancer may not have had sufficient experience of dancing without their socks. A great alternative to socks has been shown through the use of foot thongs, such as by Capezio, with numerous designs emerging as they become more popular. Additionally, there is without a doubt, the largest range of dance shoes and sneakers on the dancewear market today, with numerous brands spanning a huge range of designs. Whether they are sold for grip, support of the foot, or simply for fashion purposes, brands such as Capezio, Bloch and Sansha have all produced excellent and indeed beneficial shoes for whatever the dancer needs. To observe such fantastic alternatives to the presumable risk of wearing socks to dance provides much hope for the future of dance, in that it will continue to be provided for, regardless of circumstance.